Wilbur "Bill" D. Niebur Jr. Celebrating the life of Wilbur "Bill" D. Niebur Jr.
Be the first to share your favorite memory, photo or story of Wilbur "Bill". This memorial page is dedicated for family, friends and future generations to celebrate the life of their loved one. 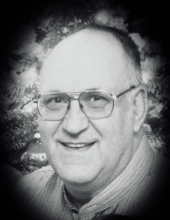 Obituary for Wilbur "Bill" D. Niebur Jr.
Wilbur “Bill” Niebur, age 83 of Lake Tomahawk, WI passed away January 17, 2019 with his family by his side. Bill was born on January 1, 1936 to Wilbur and Ruth (Parks) Niebur of Racine, WI. Bill grew up in Racine, Wisconsin where he met and married his lovely wife Ida, adopted and raised his children (Alan and Michelle), and worked as a technician at Case Tractor Test center for 27 years. In addition, he owned a small engine repair business. Bill also served as a Seabee in the US Navy Reserve and was honorably discharged after 8 years of service. Bill’s hobbies included a love of model trains and tinkering in his garage with all his many projects. He was a rabid sports fan following all the sports teams of Wisconsin. Bill had a “rustic”cabin in the Northwoods of Lake Tomahawk where he enjoyed many summers fishing, swimming, and relaxing on the lake with family, friends, and numerous pets. After retirement, he and Ida moved to Lake Tomahawk and built his dreamlog home where he lived his remaining years. He is survived by his wife Ida (Conrad), son Alan with wife Annette and 3 step-daughters, Kristin (Sean Kallas), great granddaughter Hannah; Megan and great grandson Colton; Lauren and great grandson Liam. Daughter Michelle Leigh and her 5 daughters, granddaughter, Shannah (Francisco Aguilar) and twin great grandsons, Brandon and Daniel; granddaughter, Tamara (Marco Villalobos) and great granddaughter Sofia and great grandson, Marco Jr;granddaughter, Brenna and great granddaughter Kayleigh; granddaughters, Tia Marie and Olivia Sommer; sister Betty Cleven. Nieces and nephews, Richard (Carol ) Cleven and children Lisa, John, Rich (Wendy), Scott ( Kathie), Jason and Chad; Betty Ann (Pat Decker) and children Christy, Joe and Steve; Donna Lepianka, Bob Kaplan (Rachel) and child Taylor, Linda ( Tim Akin) and children Matt, Keri and Lisa; Michael Wiskirchen (Beth) and children Russell and Keith; Tony Wiskirchen (Becky) and children Justin and Max; Richard Wiskirchen (Donna) and children Mitchell and Nick; Charles Wiskirchen (Tracy) and child Thomas and Michaela Taylor; Tad Niebur, Vickie Hinkle and Peggy Phillips. Preceded in death by both Father and Mother; angel grandchildren, Emma Catherine and William Daniel Niebur; Sister and brother-in-law, Lois and Jerry Kaplan; Brother and sister-in-law Burt and Helen Niebur; brother-in-law Orville Cleven; Father and Mother-in-law, Tony and Ida Conrad; brother and sister-in-law Russell and Doris Wiskirchen; niece Cathie Wiskirchen; nephew Andrew Wiskirchen; many cousins and friends. Cremation has taken place and a family and friends gathering will be held at a later date in Racine, WI. Please contact Ida for more information. Memorials suggested to your favorite charity or the grandchildren’s college funds. Funeral arrangements by Nimsgern Funeral & Cremation Services in Woodruff, WI. To send flowers or a remembrance gift to the family of Wilbur "Bill" D. Niebur Jr., please visit our Tribute Store. "Email Address" would like to share the life celebration of Wilbur "Bill" D. Niebur Jr.. Click on the "link" to go to share a favorite memory or leave a condolence message for the family.